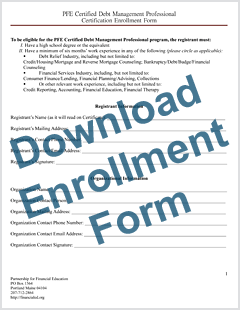 To enroll in the PFE Certified Debt Management Program, please download, complete, and mail the Enrollment Form with the appropriate payment. Click the button to pay online by credit card. You will receive a confirmation email after your purchase, and you should receive your manual within 10 business days.